There is an awful lot of DNA stuffed into every cell.Ben’s blog on stars and grains of sand got me to thinking about DNA. How long would the DNA from every living thing on Earth stretch? Could we make it to the next star? The next galaxy? The end of the Universe? Let’s start out with people. Each human cell has around 6 feet of DNA. Let’s say each human has around 10 trillion cells (this is actually a low ball estimate). This would mean that each person has around 60 trillion feet or around 10 billion miles of DNA inside of them. The Earth is about 93 million miles away from the sun. So your DNA could stretch to the sun and back 61 times. That is one person’s DNA. The best estimate I could find of the world’s population of people is around 6.7 billion. When we multiply 10 billion miles of DNA by 6.7 billion, we end up with, well, a really big number. Something like 6.7 X 1019 or 67 quintillion miles. That is too big a number so let’s convert this to light years. A light year is around 6 X 1012 miles. So all human DNA would stretch 11.2 million light years. The closest star to Earth (besides the sun) is around 4.2 light years. So we shoot way past that! The Andromeda galaxy is about 2.5 million light years away from us so human DNA could stretch there and back two or three times. What if we add the rest of the DNA on the planet? It would obviously be much farther but it is hard to calculate because we don’t know how many plants, animals, bacteria, fungi, etc. there are on the planet. We also don’t have detailed information about every species on Earth. Let’s add bacteria to the mix. I decided on this because we know how many cells are in a bacterium—one. One number I saw was that there are 5 X 1030 bacteria on Earth. 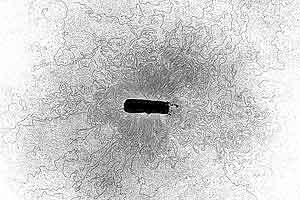 Bacterial DNA tends to be a lot smaller than human DNA so there will be less of it per cell. Let’s say on average there is 4 million base pairs of DNA/bacterium (this number could be off by a very lot). This translates to around .05 inch of DNA per bacterium which means you need to scrape together around 1.3 million bacteria to get a mile of DNA. So all the bacteria in the world have about 3.5 X 1024 miles of DNA. How far is 3.5 X 1024 miles of DNA? Well, it is about 640 billion light years of DNA. The end of the observable Universe is about 14 billion light years away. So if we stretched out bacterial DNA it would go to the end of the Universe and back around 23 times. Of course it would be incredibly thin and so actually doesn’t take up much space in the Universe. So that’s just human and bacterial DNA. (Well, mostly bacterial since human is so piddly in comparison.) I haven’t added all of the rest of the DNA out there. I’ll leave that to you. A fascinating analysis about one of the wonders of the Universe. Glad I could help. Mind blowing stuff! A recent estimate puts the cell count of the human body at 37 trillion, so the estimates given here are low since they are based on 10 trillion.